Now that you have created a stack window and saved your work it is time to start adding objects to your window. Let's start with adding an object that can play QuickTime videos. In Revolution the Player object can do this. 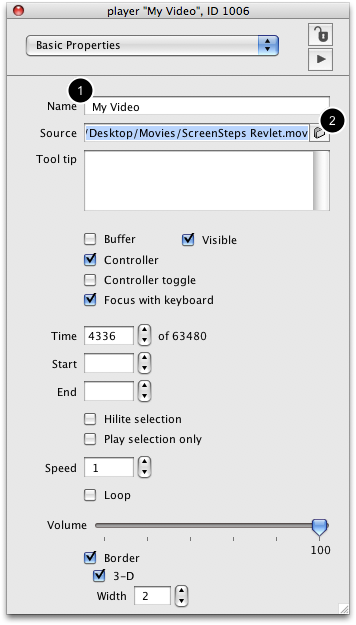 Locate the Player object icon in the Tools palette (1). Click on drag the Player object from the Tools palette onto your stack window. After you drop the Player object onto your stack window your window should look something like this. 1) Make sure the Edit tool is selected in the Tools palette. 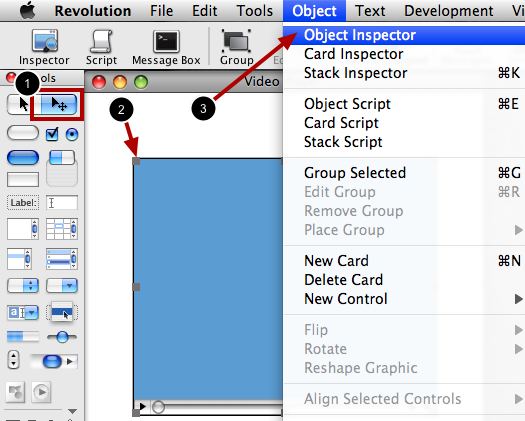 With the Object Inspector open name the Player object My Video (1). Next, click on the folder icon next to the Source field (2). This will display a file selection dialog allowing you to select a movie file. 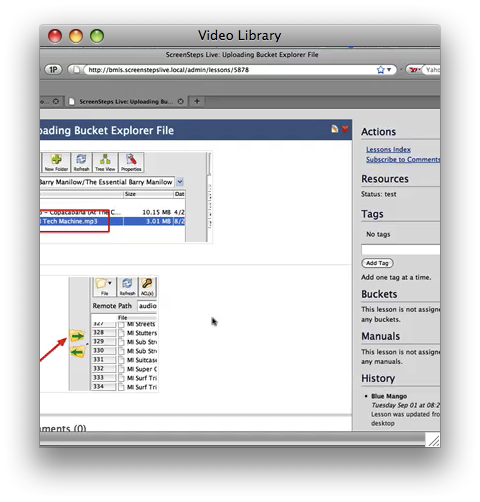 Locate a QuickTime compatible movie file on your computer and click Open to load the movie. The movie file should load into the Player object. 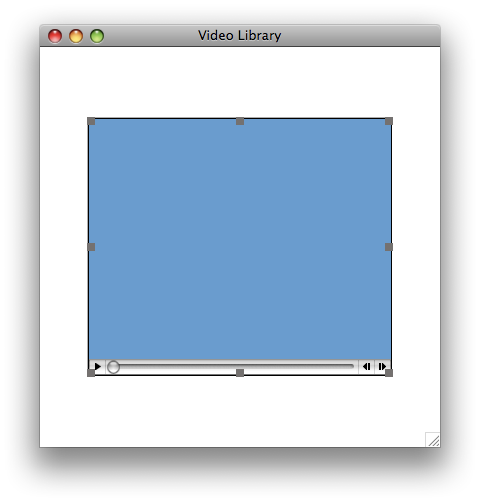 In this example the movie dimensions are larger than the stack window. 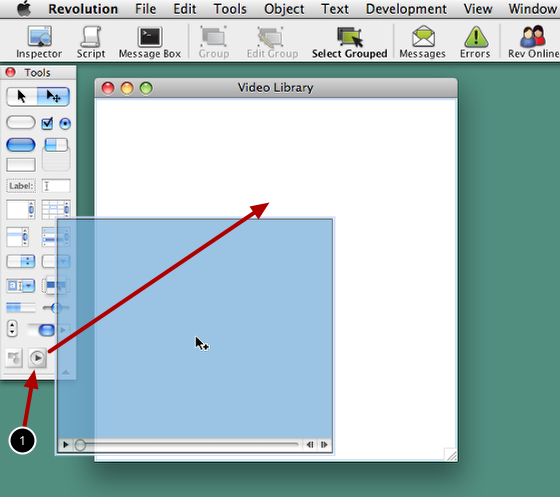 By default Revolution resizes the Player object to the dimensions of the movie file automatically. This has caused the Player object to be larger than the stack window. Resize the stack window so that the Player object fits within it. You can resize the stack window like you would any other window on your operating system. Now click on the Player object and drag it so that it appears centered within the stack window. Now you can preview the movie. To play the movie select the Browse tool in the Tools palette. 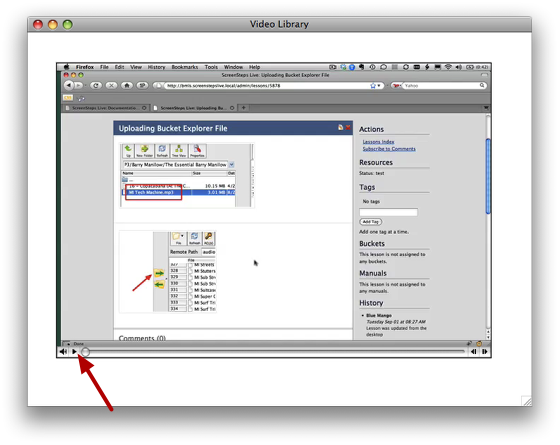 After selecting the Browse tool you can click on the play button to play the video. Now that you have created a Player object we will look at how to create a menu and dynamically load a movie based on the menu selection. I have tried this several times but when I place the video player on a stack, it is placed as a plain box, there are no controls, i.e. play, pause, sound, etc. Also in the object inspector, though I have selected the file, there are no entries in the time current time box or the "of" display. What am I doing wrong? Are you trying this on Mac or Windows? If you are on Windows, do you have QuickTime installed? FYI - I had the same problem. But after updating QT the player worked! Is their a way to have a playlist that will play a movie based from a streaming video or is this just a video player based on folders. Larry - The playlist in this tutorial is generated using files in a folder but there is no reason you cannot set the 'filename' property of a player object to a URL rather than a filename. 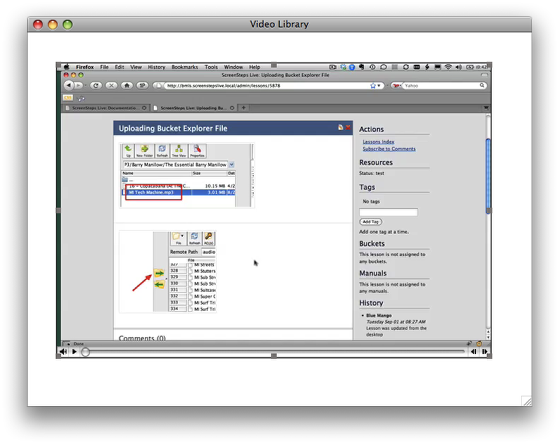 The LiveCode player object will stream the URL for you automatically. You would just need to come up with a different way of creating the playlist. I get to set name and source - select the .mov file but the time never loads and I never get the next screen. What am I doing wrong? The .mov file does work on my computer so the file isn't corrupt. as you state that the movie plays on your machine, I assume that you already have quicktime installed and not an other player. When you say: "the time never loads", then I assume you are referring to the controls that appear at the bottom of the player window, which indicate the play times of the movie. If these disappear from your stack window after loading the movie, then it is likely that your movie dimensions are larger than the stack window and the controls have moved beyond the boundaries of the stack window. Try enlarging the stack window and see if the controls appear again. As Revnewbbbie above, I see neither the movie nor the visual controls for the movie. I have QT 7.73 installed on Win 7 32-bit; it works. I have tried enlarging the stack window to no avail.It would help me to know more than just the month, date, and time of the comment. that is puzzling. If you do not see the control when you drag the QuickTime Player Object, then LiveCode does not seem to be aware of the QuickTime installation. 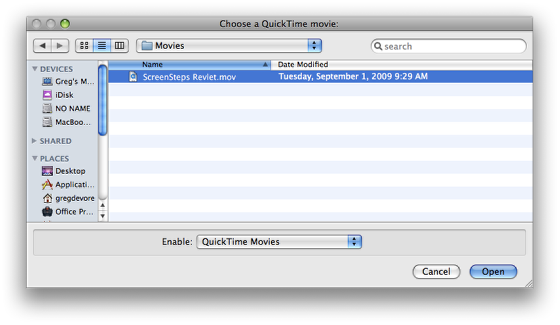 I have the same version of QuickTime installed and am able to play quicktime movies through LiveCode. Did you try restarting LiveCode after you installed QuickTime? Repeated the experiment an another computer, and still no joy. 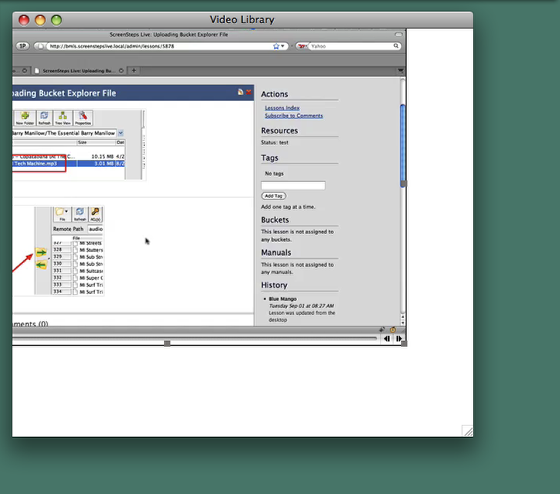 QT 7.7.3 is installed and set as the default player for QuickTime. mov files. Live Code does not display the player controls when the player is dragged on to the mainstack. Any chance that I am making some kind of non-obvious error? can't think of anything obvious here. You could also test if the "dontUseQT" property is set to true, preventing QuickTime from being used. You can find more information on these properties in the LiveCode dictionary. Will this work on Linux ?